Awww que fotos tão divertidas :3 adorei! Estás muito gira, gosto do look também! As sabrinas e o lenço são as minhas peças preferidas! Gostei imenso. Estás muito gira! I love the photos, it looks like you're having so much fun! I really want that scarf. Oh, this is such a cute look! I really love that scarf. You are soo pretty! I love the outfit and I love the scarf:))! I really like these pics. Feliz fin de semana y un gran abrazo! Ok...as tuas fotos são sempre tão giras e divertidas, como consegues?? Eu nunca sei o que fazer e fico sempre igual e parva! O look está muito gira, mas o que gostei mesmo foi o cabelo!! Tens de mostrar como fazer, ficou tão lindo! Adoro!! E o teu penteado, está tipo lindo demais!! So nice pics and I like that hairstyle. Have a great weekend. i like you and your style! 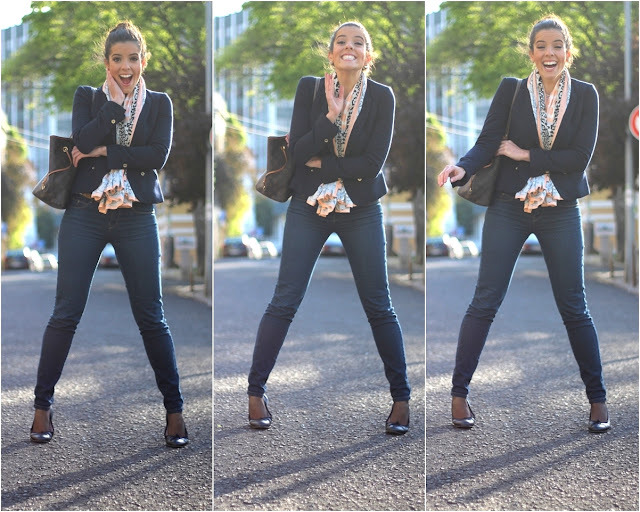 Super cute pictures - you're so lively and energetic :) and I love your scarf so much! Fabulous outfit for class. Very pretty! You're so beautiful and very stylish! I just got your message on Facebook. I'm following you now via Google Friend Connect. You can follow me via GFC too. If you take your mouse to the right edge of my blog, a toolbar will pop up and the following option should be the first one.